Malcolm Turnbull has reasserted this week that the Liberal Party needs to be in the ‘sensible centre’. Now that the Liberals and commentators have overdosed on a debate about where the party’s founder stood on the centre-right spectrum, could someone go to a shopping centre and ask a dozen people under 40 who Robert Menzies was? How many would know? And if the mall happened to be in multicultural western Sydney, what chance “Ming” would have any recognition? This week’s argument may have meaning for the Liberal tribe, and in the context of Malcolm Turnbull’s fightback against the conservatives who are making his life hell. But to many families in the suburbs and the regions, it would likely come across as just irrelevant “insider” stuff. While a lot of people just shrug impatiently at insider politics, a substantial number have turned to “outsider” players. The challenge to the Coalition vote from the confronting “outsider” Pauline Hanson brand was clear in polls out this week. Newspoll had Pauline Hanson’s One Nation on 11% for the second poll running. This was ahead of the Greens, who were at 10% in the latest poll, and 9% in the previous one. ReachTEL polling commissioned by The Australia Institute, a progressive think-tank, and done on June 8 in the seats of six ministers and the prime minister, shows very diverse but some substantial results for One Nation. The figures are: Cook (Scott Morrison) 16.7%; Curtin (Julie Bishop) 4.3%; Dickson (Peter Dutton) 14.1%; Flinders (Greg Hunt) 8.9%; Kooyong (Josh Frydenberg) 3.6%; Sturt (Christopher Pyne) 3.8%; and Wentworth (Turnbull) 8.1%. If the “undecideds” were distributed, the figures would be higher. Although it’s unclear how much of the One Nation vote would hold at an election, the Newspoll level should be of concern to the Coalition, especially as the minor party has had a lot of bad publicity recently from internal scandals. It’s a national figure for a party whose support is lumpy. We know it is particularly strong in regional Queensland. How strong will be tested in the coming state election, when the Liberal National Party (LNP) will be looking to harvest One Nation preferences, formally or informally. Unlike the situation with the Greens and Labor, where the ALP can rely on receiving the overwhelming bulk of Green preferences, the One Nation flow on to the LNP will be less disciplined. Some One Nation voters would be former Labor supporters. The test major parties face from “outsider” players is explored in a new book by respected British political commentator Steve Richards, The Rise of the Outsiders: How Mainstream Politics Lost its Way. He looks at the phenomenon across national boundaries, including a modest reference to Hanson and the Australian experience. In an era of globalisation and rapid change, the answer to the question “who rules?” can be unclear. Richards notes that insiders’ power is less than it looks. “Elections, opinion polls, the media, constitutional checks and balances and the near-impossibility of managing a party’s internal tensions mean that elected power is fragile and often fleeting,” he writes. “Most leaders or governments in democracies rule precariously, partly because they pay so much attention to the voters. “Yet voters regard the democratically elected as out of touch, part of a lofty, arrogant elite. The opposite is closer to the truth. Richards argues that one inadvertently positive contribution the outsiders have made “is to trigger constructive questions from mainstream parties about what form the centre ground takes, and tentative questions about the role of government in a globalised economy”. In the Australian context, this week Turnbull has reasserted that the Liberal Party needs to be in the “sensible centre”. We have recently also had the Coalition embrace a more active role for government than the Liberals would have advocated three or four years ago – such as a stated willingness to invest in a coal-fired power station, and the use of export controls to ensure a bigger supply of gas for the local market. It seems obvious that the best place for the Coalition to pitch its tent is the “sensible centre”. That, we know – or believe – is where elections are decided. Turnbull is competing for swinging votes that could go to either him or Bill Shorten. Many of these voters are pragmatic, uninterested in ideological wars, or in what Menzies might say if he were alive now. They just want things done – about power prices, health, education, whatever. But that 11% is a different kettle of fish, or maybe it contains several kettles. They are deeply cynical about today’s political process and major parties; the siren call of Hanson, and some in the media, picks up on that. These people, like some in the Liberal base – and they are overlapping cohorts – will be more drawn to Tony Abbott’s manifesto than Turnbull’s sensible centre. The Turnbull government has genuflected to them by playing gesture politics in immigration, revamping foreign worker arrangements, and proposing the English test for potential citizens be ridiculously tough. It will have a careful eye to the demands of the coal lobby as it tries to land its clean energy target. But those attracted to “outsider” politics would prefer the Abbott-style bald negativity toward immigrants and renewables. The Liberals enjoy pointing to the two core constituencies Labor has to juggle – lower- and middle-income workers, and affluent inner-city progressives. But the Coalition has its own dual constituencies – the mainstreamers, and the punishers on the right whose power is a protest vote. The reference to Tony Abbott in his London speech gave Malcolm Turnbull some body armour. It’s passing strange when Eric Abetz, the navy-blue conservative sacked from the ministry by Malcolm Turnbull, is out defending a prime ministerial speech on the Liberal Party’s history and positioning. But, then again, these are indeed the strangest of times on the non-left side of federal politics. 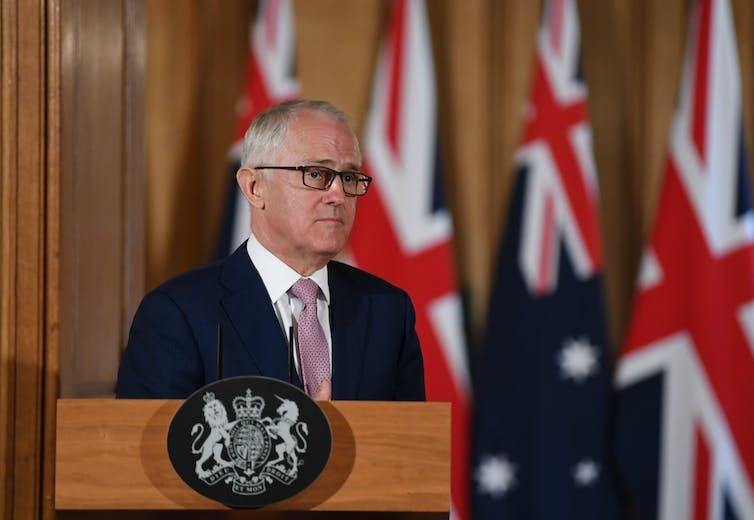 Turnbull’s Monday address in London to the centre-right Policy Exchange think-tank presented a fairly conventional set of references to Robert Menzies’ founding of the Liberal Party, most of which you’d find in the standard texts on the party’s past. He noted that Menzies: “went to great pains not to call his new political party, consolidating the centre right of Australian politics, ‘conservative’ – but rather the Liberal Party which he firmly anchored in the centre of Australian politics. Talk of the two streams in the Liberal Party (John Howard’s “broad church”) is familiar. Wars over Menzies’ philosophical legacy have long been waged among the faithful. Menzies is an icon that both conservatives and liberals in the party try to claim for their own. And every Liberal leader wants, indeed needs, to link to Menzies. In fact they can all find succour from the Menzies well – he was prime minister for a long time, a pragmatist, and dealt with and responded to varying circumstances. If Turnbull on Monday was having a calculated slap at conservatives in the party, it was a pretty mild one. If he was emphasising he’s a centrist, that is hardly a surprise, although when he translates it into policy it annoys the hell out of those on the right. The reference to Abbott in his London speech gave Turnbull some body armour. It was actually a latish insert. It was in the speech Turnbull delivered, and in the version sent out at 3:32am EST. But the excerpts handed out very much earlier to the travelling media and reported in Tuesday morning’s papers in Australia did not contain it. As it turned out, it was a judicious addition. Of course everything Turnbull now says is taken as inflammatory. Being ready to combust is the default position of Turnbull’s party enemies (though not Abetz or some other notables on this occasion), the right in general, and a good section of the media. While what he said in the London speech was perfectly reasonable, as well as being previously walked territory, whether he should have said it is open to argument. 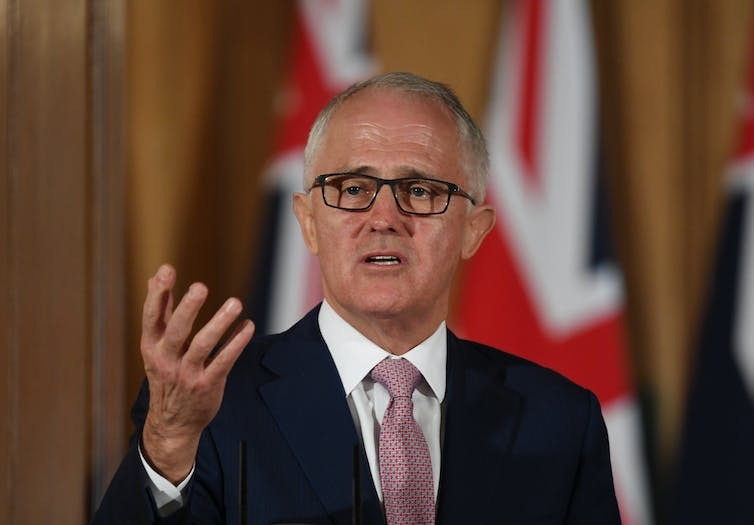 The cautious approach would have been for Turnbull, when making an address overseas, to avoid anything that could lead to trouble in the ranks. Until the speech, his trip had given him a respite from the wrangling. On the other hand, if Turnbull can’t say a few obvious – indeed can we say sensible – things, he will have forfeited his leadership in everything but the title.